The Tour de France, the largest cycling event in the world, has just wrapped up after 21 days. The gruelling event saw cyclists compete over 21 stages and 3,664km, beginning in Leeds, England, and finishing in Paris, France. The race concluded on the 27th June, with Vincenzo Nibali winning the 101st edition of the event with a margin of seven minutes and 37 seconds, the largest since 1997. Nibali is the only one of six to win all three Grand Tours. Dominating throughout, he wore the yellow jersey for 18 of the 21 days, securing himself as the first Italian winner since Marco Pantani in 1998. MacWet gloves are the perfect addition to any cyclist’s gear, providing the ultimate grip in all weather conditions. Find out more here. The Commonwealth Games start today! The 2014 Commonwealth Games, the third largest sporting event in the world, is beginning tonight in Glasgow, Scotland. With 71 teams and 4,947 athletes competing across 261 events, the Games attract elite athletes from all 53 members of the Commonwealth of Nations. Athletes will perform in events such as cycling, shooting and squash across 11 days of competition in the hopes of attaining the coveted gold medal for their home nation. MacWet gloves are the perfect addition for any sports-person in need of extra grip. MacWet’s ‘all grip, no slip’ technology has made the gloves a worldwide success and they are now used in over 35 different sports and activities. Find out more about MacWet gloves here. 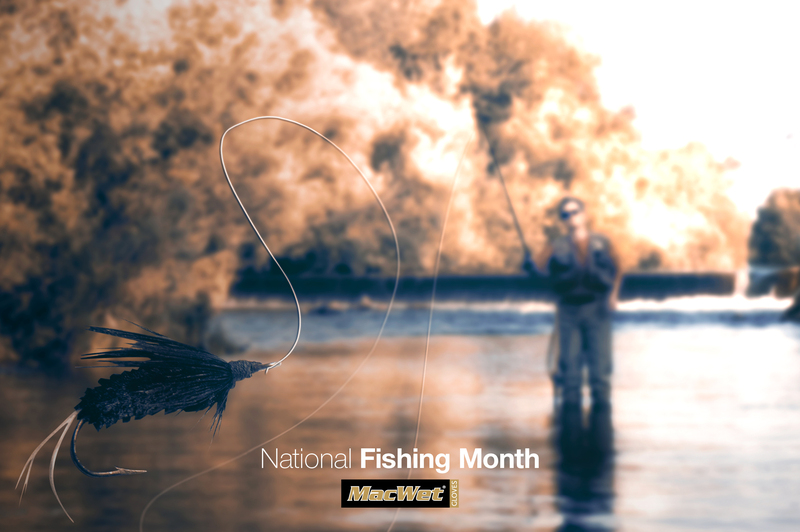 Today marks the beginning of National Fishing Month. The day was formed to get family members of all ages to get outside and fish no matter what social or cultural background they are from. The initiative has grown exponentially over the past few years, and this year is set to be the most successful yet with more than 150 events planned across the country. MacWet gloves are perfect for fishing thanks to the ‘all grip, no slip’ technology allowing you to maintain maximum control of your rod, even in the wettest of conditions. The gloves also work with touch screen phones, ensuring that there is no need to take them on and off repeatedly throughout the day. For more information on National Fishing Month and what events are happening in your area, visit the website: http://nationalfishingmonth.com. We have rounded up all of the news over the course of this week regarding the people we sponsor. MacWet sponsor Ronnie Green has been continuing to impress recently, having passed selection for “British Shootings” England Talent Pathways programme. The programme has been designed to develop and nurture raw talent in to Olympic medal winning potential for the 2016 and 2020 Olympic Games. With his chosen discipline being Olympic Trap, Ronnie is now receiving regular training at Nuthampstead Shooting Ground from team GB coaches Martin Barker and head shooting Coach Christian Schofield. At just 14 years of age, Ronnie has already proved his commitment and desire to make it to the top. Because of this, he has received sponsorship from both Dartford Clay Shooting Club and Southdown Gun Club who provide all of his training needs. Ronnie shoots a Beretta 682 and Fiocchi “F” range cartridges and he is now hoping for support from the leading Italian cartridge manufacturer Fiocchi UK. MacWet gloves have further helped Ronnie to maintain confidence and control whilst shooting. We would like to wish him all the best for what is shaping up to be a very successful future! A part of 26 Engineer Regiment, the team qualified from the Brigade Operational Shooting competition (BOSC), where they came second overall, to compete at the Divisional Operational Shooting competition (DOSC). With 50 team entries and 11 qualification slots, the 25 Engineering Regiment finished 8th out of a total of 50 team participants. The team wore their MacWet gloves throughout the competition, making maximum use of the ‘all grip, no slip’ technology that has made the gloves respected by shooters the world over. Congratulations to Jessica Mendoza who is now an official MacWet sponsor! Jessica, an 18 year old showjumper, has been branded as one of the sporting stars of the future by Sky Sports. Beginning her career on the international pony circuit, Jessica has propelled herself to be one of the most successful junior showjumping riders of all time. With an impressive amount of victories under her belt already, Jessica is now beginning her career in horse and senior classes and has already taken wins at Grand Prix level. Jessica has been wearing her gloves in a variety of events across the UK and Europe, including a win in her first 4 star class and finishing as a runner up in her first 4 star Grand Prix event at the Antwerp Leg of the Global Champions Tour. With a bright future ahead of her, we plan on seeing Jessica out there sporting her MacWet gloves for a long time to come.